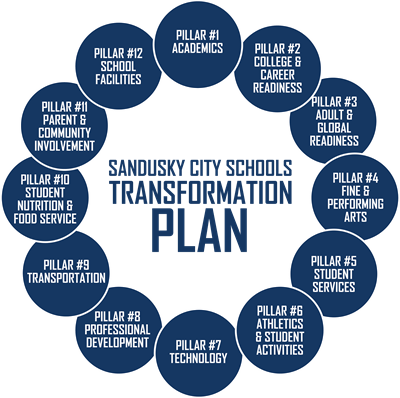 The Sandusky City Schools Transformation Plan was the culmination of an extensive amount of research, collaboration, and input from staff and community members. The CEO and Superintendent, under the direction of the Board of Education, completed the task of assessing the overall academic and organizational quality of the Sandusky City Schools. The Sandusky City Schools have always had a strong legacy of tradition, pride, and excellence that is evident in the daily operations of our schools. Introduced on March 27th, 2014, the Transformation Plan is designed to meet and exceed the expectations of the 21st Century and was organized with priorities to improve the educational delivery system of the Sandusky City Schools. Our primary goal is to dramatically redefine the delivery of academics and educational services to position our students to compete on a global level. The Sandusky City Schools Transformation Plan is built on the existing Strategic Plan while offering an innovative new direction for our schools.